Our title is taken from an article in the Christian Courier periodical, editor Wayne Jackson. (“Christian Courier,” Vol. XXV, No. 11, March 1990, P. O. Box 55265, Stockton, Calif. 95205). Jackson was long an outspoken critic of Covenant Eschatology, and is one of the few who have actually attempted to address the language of imminence in regard to the parousia, i.e. the coming of the Lord. Evidently, Jackson does not believe that God can tell time, or, that He tells the truth about time! Jackson holds the view of many, that prophetic time statements about the coming of the Lord in effect mean nothing at all about time. While this article will focus on Jackson and his claims, it must be understood that his views are representative of a wide range of Bible students. In the article at issue, Jackson addressed the claim of a preacher who asserted that men cannot understand the Bible alike. In answering that claim he makes some very important, but self destructive claims. “The problem with those who contend that men cannot agree upon the scripture’s teaching is simply this: they are seeking a way to justify error!” (all emphasis his). We can only add a hearty “Amen!” It would certainly seem, on the surface, that Jackson does believe that God can tell time! With these thoughts before us, it becomes exceedingly strange, and revealing, to then read what Jackson has to say about the Bible’s repeated declarations that the parousia was imminent in the first century. In the September 1989 issue of the Courier, (Vol. XXV, No. 5, September 1989). Jackson wrote an article The Time Element in Bible Prophecy in which he asserted the “elasticity of prophetic chronology”; that “Biblical prophecy is so flexible in terms of time”; “prophetically speaking, time is relative.” In his little commentary on Revelation, Jackson again declares that time statements regarding the parousia are “extremely relative”; and posits the “chronological flexibility in the scriptures.” (Wayne Jackson, Select Studies from the Book of Revelation, Courier Publications, same address as the Courier, 1995), 120). So, can God tell time, or not? If Jackson is correct about God and prophetic time statements, then God cannot or does not communicate in a “lucid” manner, not “intelligibly,” nor “clearly”! Thus, Can God Tell Time? Not really according to Jackson! Please note Jackson’s illustration: he says if a store advertises a sale that people come to the store “on the correct day at the right time,” and that the people have correctly understood the ad. Why is it different with prophecy? To be candid, it has to be different for Jackson and those like him because if the time statements of scripture are honored they must surrender their futurist views. It is that simple! Jackson’s point is that the business has communicated in plain, intelligible language. The business has used language that communicates certain ideas about time that man normally and correctly understand. Jackson is saying that God communicates with man in the same way that man communicates with man! Otherwise, his illustration is absurd. But then, when Jackson considers prophetic literature (more specifically, when Jackson is arguing against Covenant Eschatology!) we are supposed to understand that God purposefully communicated in such a way that man cannot know whether the Lord meant what his words indicated! If a store advertises “Coming Soon: Huge Sale!” does the public have a right to understand that sometime in the very near future a big event will actually take place? While “soon” has not told the day and hour of the coming event, it most assuredly has truthfully predicted an imminent event. Jackson says we must understand this language as objective, that we have a right to expect these kinds of statements to be true when communicated by man. On the other hand, if God said something was coming “soon,” or “must shortly come to pass” this is another matter! In this case language is not so lucid or intelligible! Jackson says that if we say God “could not clearly make Himself known to man,” that this reflects on the power of God. True. Certainly God knows what “at hand” means to man does He not? If then the Lord knew what those words of imminence would indicate to man and did not wish to communicate those ideas, was He so limited in His vocabulary that He could not find the proper words? If He knew the ideas the words would communicate, and did not actually wish to communicate those ideas, but used the words anyway, what does that say of His honesty? Since God in His wisdom knew what ideas the words He used would communicate and he used those words we can only conclude that God wished to communicate the ideas contained in the words He used! Jackson correctly asserts that since man is able to communicate clearly with man, God “who is infinitely wiser and abler than man, can clearly make His will known to humanity.” But at the same time we are to believe that this “infinitely wiser and abler” communicator has purposefully used words that indicate imminence when in reality, per Jackson, God was using those words not as man understands them, but “from the perspective of time as God sees it.” Nothing could be clearer than this contradiction in Jackson’s “logic” about God and his manner of communicating with man. Patently, man does communicate imminence using the identical words as found in scripture. It is equally plain to any thinking person that God could have (and did!) communicated imminence by using the very words that He did. Surely no one would argue that “at hand,” “shortly,” etc. normally mean a “long time,” “delay,” etc.. Thus, God could have communicated imminence by using the words found in scripture. It therefore is a question of whether God willed to communicate the concepts found in those words. Would Jackson argue that God did not intend to convey the meaning inherent in those words? If God did not want to communicate actual nearness when He used the words of imminence, why did He use those words? According to Jackson, when man communicates with man and uses the language of imminence then those words are to be understood as expressing objective imminence. But, when God used those identical words they took on a totally different meaning known only to God! Wait a moment, I think I am beginning to understand what Jackson is saying! He wants us to understand that when God communicates time words to man that He “clearly,” “intelligibly” and “lucidly,” communicates in “elastic,” “flexible,” and “extremely relative” terms that do not, in fact, “clearly,” “intelligibly” and “lucidly” communicate nearness! If this were any discussion other than religion, to make such a claim would result in being laughed off the stage! So, per Hebraic thought, God communicated straighforwardly with man and expects man to understand Him. Now, it is to be granted that there are strains of Hebraic thought that go far beyond this, such as the Kabbalists, but, that is not our point here. The answer to the question, Can God Tell Time seems to be that according to Hebraic thought, He most assuredly can and does! If, as my Israeli friend says, and as Jackson states above is true, then it is patenly inconsistent for Jackso to them turn around and claim that God does not speak in the language of man. Remember that Jackson says it “reflects upon the benevolence” of Jehovah to say He purposefully did not reveal Himself to man in a lucid and intelligible way. But he then turns around and says that: God purposefully did not communicate to man in a lucid manner in regard to prophecy! God had a “hidden agenda,” a “mental reservation,” “non-lucid” intent. Jackson says that when God said something was near He was thinking of time as He sees it, not as man sees it. The trouble is that God never told man he meant “soon in the way I see it, and not man.” The other trouble is that God does not see “time” at all in His dimension! Time is a reality only in this dimension. Thus to say that God used time words as He sees time is totally inaccurate! He actually sees time the same way man does, since He gave man our time words! There is something else here. We full agree that it “reflects on the benevolence of God,” if Jehovah did not communicate clearly to man. Consider then what Paul told the Thessalonians, being persecuted for their faith. By the inspiration of the Spirit, the apostle promised them that they would receive relief from that persecution, “When the Lord Jesus is revealed from heaven” (my emphasis). Now, Jackson affirms that Jesus did not come and give the Thessalonians relief. Does this not mean that God was not benevolent to the suffering Thessalonians? It most assuredly means exactly that! There is no escaping the language of the text. It was the Thessalonians that were being persecuted The present participial form of thlipsis is used four times. Paul promised the Thessalonians relief (From the Greek word anesis, which means relief, not reward). And, he promised that relief would come when the Lord came. Of necessity that demanded that the Lord was coming in the lifetime of the Thessalonians, for if they were going to get relief from that persecution, then the Lord had to come while they were being persecuted! Did God promise that relief, and not give it? What would that say of His benevolence? Jackson is certainly correct: if God could not clearly make Himself known to man this reflects on the power of God. If he did not reveal Himself lucidly it reflects on his benevolence. But per Jackson’s own logic (?) and statements, God purposefully has not communicated lucidly and intelligibly with man in regard to the parousia. He had a hidden agenda. He has spoken relatively. He has spoken ambiguously. He has spoken deceitfully! Jackson posed the question Can God Make Himself Understood?, yet per his writings against Realized Eschatology he wants us to believe that God refused to make Himself understood! His article says that all men should understand scripture alike. Yet we are to believe that the only thing man can agree on about God’s time statements is that we must agree that they mean nothing, and that we cannot understand them! Finally, Jackson is certainly correct to say that those who contend that men cannot agree upon the teaching of scripture are simply seeking a way “to justify error.” The problem is, to adopt Jackson’s view is to agree to misunderstand. It is to believe that the scripture has no meaning! It is to agree that God actually cannot or would not communicate lucidly with His Creation! This is unacceptable to those who wish to honor Jehovah. God can and did make Himself understood. It is the view of those who, on the one hand claim that God communicated lucidly and intelligibly to man, and then, on the other hand, claim that His lucid communication is vague, ambiguous and extremely relative, that is difficult to understand! 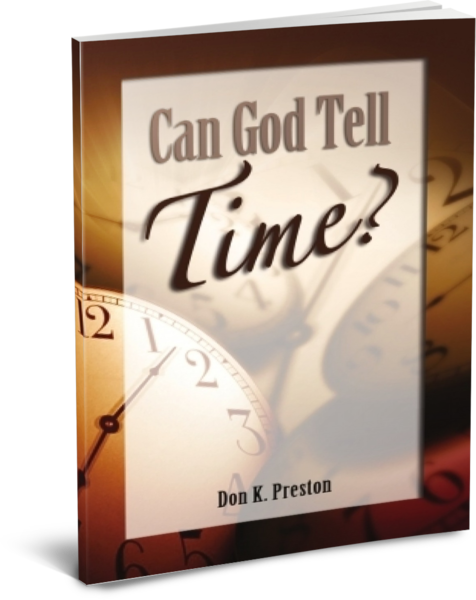 If you want a definitive, Biblical, thoroughly documented answer to the question, Can God Tell Time, get a copy of my little book by that name. Can God Tell Time? Absolutely! Next Next post: Going to Heaven – What Does It Take?